Various Artists - African Scream Contest 2. Vinyl LP, CD. Bleep. In the past decade, much great music from the early days of post-colonial Africa has been repackaged in compilations from labels like Soundway and Strut. While these records have tended to focus on the big-hitters of the Sub-Sahara - Nigeria, Ghana and South Africa to name but three - it is easy to forget that smaller African countries have their own rich musical legacies that are worthy of re-evaluation. 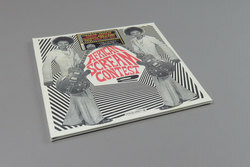 Analog Africa’s 2008 compilation African Scream Contest did a fine job of shining a light on the rock, funk and soul stylings of 1970s Benin, and ten years on label-founder and celebrated digger Samy Ben Redjeb has unearthed fourteen more gems from the small nation wedged between Nigeria and Togo. Great artwork too.